The following article by Posted by Ralph Meranto appeared in the Democrat & Chronicle January 23, 2016. Beautiful mid-century details, like this wall unit in a Don Hershey designed home are ending up in dumpsters. Can we all stop apologizing for the style of our houses? Just because a house was built in a particular decade does not mean it needs to be “updated” to look like a new-design home. Guess what? Some people like old houses! In your attempt to “update” you can actually destroy original details that make a house desirable. Hindsight is 20/20 here. In the 1950s and 1960s magazine articles encouraged people to paint their “dark, tired, old wood trim” to make their rooms look “larger.” Guess what? The room (shockingly) was the same size it always was, but the nice wood trim was now destroyed. People now bemoan painted trim in early 20th century homes and try to “restore” them back to their original beauty. A recent article in the D&C Real Estate section explored a Brighton home that owners spent $30,000 to “renovate” while prepping to sell. In the article they discussed painting, removing worn carpet and refinishing hardwood floors. Those moves make good sense because they freshen without destroying original details. But the family also painted their fireplace and original 1950s wood cabinets in the kitchen. These decisions can turn off a buyer looking for an original 50s style and do not hide the fact that the house and cabinets are 60 years old. In my home, a previous owner actually chopped off part of the fireplace hearth to make room for a piece of furniture. 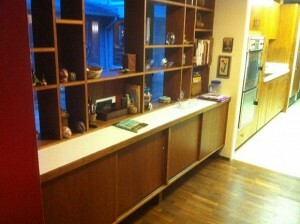 The article also mentioned that the home-owners replaced the kitchen linoleum that “was in vogue mid-century”. Guess what? Mid-century homes are in vogue again. Original-condition homes from this time are selling fast, so your updates could actually hurt chances to sell your home. Home buyers are smart enough to look past a countertop or floor they don’t like. Wouldn’t you rather pick out your own flooring and countertops than pay for someone else’s decorating choices? When home shopping, I walked away from several vintage homes that had been destroyed with cheap engineered flooring and other “updates”. I don’t want to pay for updates that I have to un-do. The time and money a seller wastes (not to mention the taxes, utilities and insurance paid during this time) could be better put toward a lower selling price and a faster turn over. Of course some repairs are useful. Fix cracks and paint your walls? Sure! Replace a worn roof. Yes! Replace aging mechanicals? Great! But band-aid decorating updates on a vintage home are the equivalent of painting a new dress on the Mona Lisa because her dress is out of style. Embrace the design the original designer and builder intended and lets preserve the great history of architecture in America. People seem to become so short- sighted when it comes down to selling their homes.Well said! Thanks for your comment Maureen! Now if only that sentiment could be emphasized for houses of all ages. I count myself very very lucky to have found and bought a c.1928 time-capsule. Despite things being under restoration, we get countless compliments on our original kitchen cabinetry and sink, “fabulous” original light fixtures, and the original details on the front of the house which the previous Owner had covered with vinyl siding. Every tiome we get one of these compliments I always think to myself…”duh, the reason it looks good is because its original and hasn’t succumb to short-lived dated trends”. Absolutely true! Thanks for your comment Chris.